THE NEW 2018/19 WINTER-HOME COLLECTION HAS NOW ARRIVED, & IT'S AS SUMPTUOUS AS EVER! 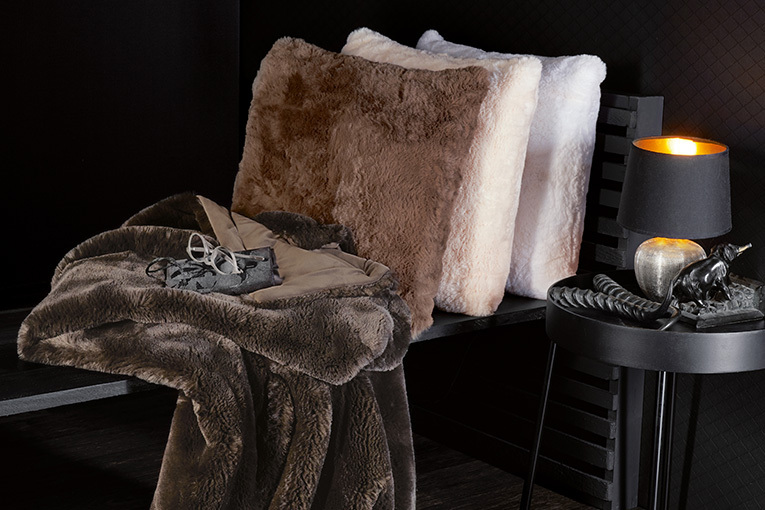 These authentic looking Faux-fur & Textiles have been produced using innovative production methods and high tech fibres, resulting in the softest and most luxurious products. The extended collection now includes Gioia, a Throw made from fluffy bamboo - it's natural, easy care and cuddly in 7 desirable colours. The timeless Shyleen Blanket boasts updated colours and is now available in a larger 130x190cm size called Scarlett. The ever popular Winter Faux-fur Blankets & Cushions come in a fabulous selection of designs. Choose Lynx or Serval to tap into in the leopard print trend or use the new sophisticated Koala and White Lion designs for a plush, tactile interior scheme. Fashionable new Faux-fur Sheepskins in natural taupes and rich midnight blue and purple are suitable for use as seat and armchair throws or floor rugs. This years accessories include the ever popular Bears, Gift Bags, luxurious Slippers, Hot Water Bottles & Scarfs - making gorgeous festive gifts for all. Only available while stocks last so don't miss out, request your Winter Home brochure now! Call us on 01274 518888.